We’ll start our Easter Celebrations in the same kind of place, where Easter began, a graveyard. What makes Easter Easter is the death of death, so we’ll celebrate in the abandoned home of the dead. If that sounds cryptic, it’s not, it’s just that unfathomably good news. This service will be a short and intimate. This is going to be a party! We’ll celebrate with breakfast and coffee, as we start the process of wrapping our heads and hearts around Jesus’ Resurrection. We’ll celebrate in some familiar ways and some unique ways including composing a Flowered Cross and a huge Stained Glass Window art project. This celebration will run straight into our 11:00AM worship service to create awesome time of worship. Get there early for a good seat. 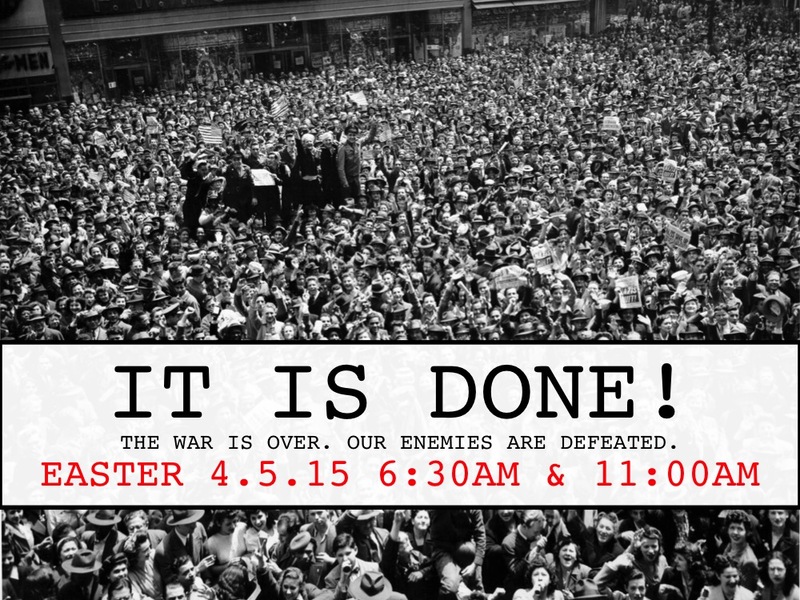 Posted in Events and tagged Easter, He Is Risen, It is Done, Jesus Wins, On the Third Day, Resurrection, Sunday.